Replaces the single favorites menu with categorized menus. 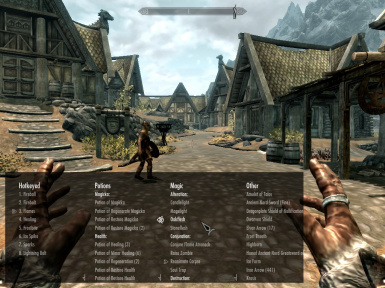 Bethesda for creating Skyrim, and skyrimnexus for creating this forum. Please read this section and the FAQ below before posting to the discussion page. SKSE, you'll have to edit the configuration file). Recommended minimum resolution is 1024x768. Categorizes favorited items into separate lists. Each list can have sub-categories, for organizing your items further. (experimental). See "Equip sets" below. see this article at The Backline. 1 to 9 with item selected: Hotkey selected item. Ctrl + w/s/left/right: Moves the menu up/down/left/right 5 pixels. Hold ctrl+shift to move by 1 pixel. Ctrl + f: Create an equipset from the currently equipped items. Ctrl + delete: Delete the selected equipset. See the Compatibility section below for more details. 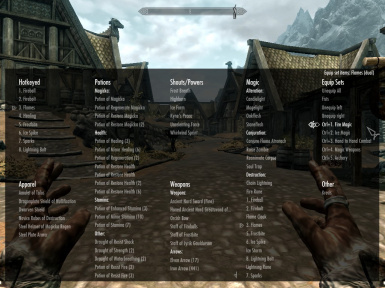 Problem: The menu is too big / off screen. The default config file was configured for a resolution of 1024x768. Use ctrl + w/s/left/right: Moves the menu up/down/left/right 5 pixels. Hold ctrl+shift to move by 1 pixel (which requires SKSE to save). 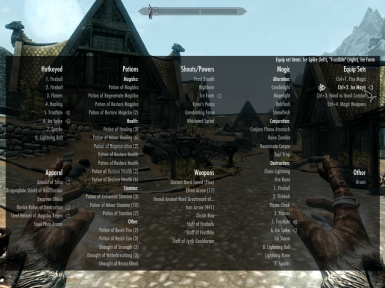 How do I edit favoritesmenu.cfg effectively? reloaded each time you open the menu. See the "Installation" section below. Use an encoding of UCS-2 Little Endian / UTF-16LE with BOM (particularly for translations). ANSI / UTF-8 works for English language configs. Problem: Some of my items are miscategorized. Are you using the English version of the game? See the "Compatibility"
your game isn't, then it won't work. for how to configure the menus. Problem: My game crashes when I try to save. Problem: Left / right mouse clicking isn't working. Your controlmap.txt might be weird. Try the "Right-Left-Mouse-Button-Fix"
file in the "Optional Files" section of the download page. Also try loading a "hard save", instead of a quick save or an auto save. Some people have said that works. / some items don't equip / something doens't work quite right. Equip sets are experimental, and might not work quite right all the time. Equip set hotkeys only work when the favorites menu is open. Items have to be favorited to work in an equip set. Equip sets allow you to specify a set of equipment to equip all at once. favorites menu won't know about it!). delete and then pressing ctrl+delete. another mod. The favorites menu must be open for these hotkeys to work. your link and/or screenshot to the files at the "Custom Configurations"
have the most up-to-date information and versions. 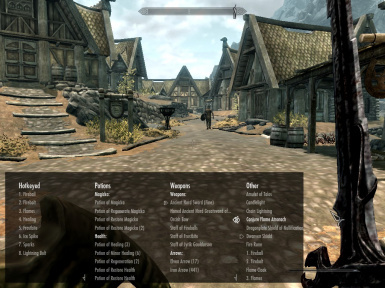 Delete favoritesmenu.swf and favoritesmenu.cfg from the game folder. 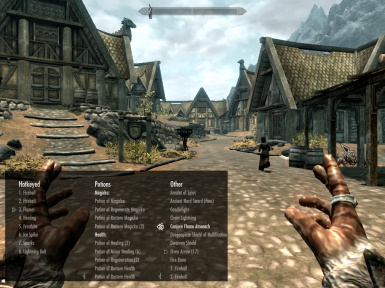 non-Steam PC versions of Skyrim. about favorited items -- just its name, hotkey, and some index values. Download the "Better Sorting - CFM config file" in the optional files section. 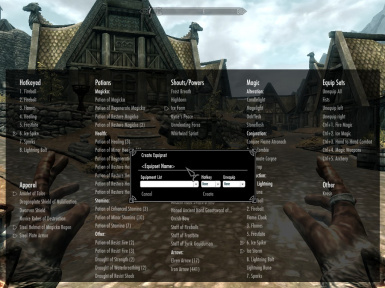 Utopolysts Item Sorting is also compatible with CFM. The following links are to translations of the config file. These translations are the work of other modders and users. UTF-16 encoding (the config file for v0.1.5+ is in UTF-16LE). Please include only the config file, not the SWF file (favoritesmenu.swf). the entry text can shift by 1 pixel. - Corrected spelling of "bradonbane" in config file. favorited items, configurable with "auto_favorite_prefix". is a Flash key code. - Added a "Resistance" sublist to the potions list. - Removed the game version check from CFM_extesions.dll. - Fixed glitch with saving unequip options when creating an equipset. 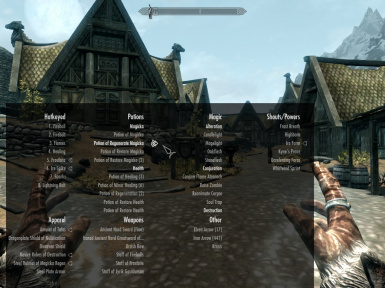 - Fixed equipset hotkeys which broke in v0.1.8. you'll have to keep tapping the keys. settings (the dialog is admittedly crude). Equipsets are saved to a file called "favoritesmenu_equipsets.cfg"
and the equipsets in favoritesmenu.cfg will be ignored. the game to get out of the menu. whatever the game tries to reequip for you. - "equipsets" no longer needs to be specificed for an equipset list. All equipsets go into the (single) equipset list. - "other" sublists are now sorted alphabetically. Win1251 text is translated to UTF-8. sublist in v0.1.7, but not to its parent list. Added "Lightning Bolt"
and list title are also aligned. then press W. The list will recenter on the selected item. long lists can flow down into the rows below them. backwards compatibility with earlier config files. sections. A sublist's excludes are not added to the parent list. problem for some people. Thanks to villian123 at skryimnexus. section head / divider / name. with "title_color" in a [list] section. These are HTML color codes. - Added "venom" and "aversion" to poisons sublist. keywords (except for "scroll of") are removed. - Fixed the issue with the list titles not picking up the right font. The titles should pick up "$EverywhereMediumFont" variable. The "title_font_name" configuration option is now obsolete. - Hotkey colors are configurable with "hotkey_color" in the config file. "divider_color" in the config file. - Renamed the readme file to "CategorizedFavoritesMenuREADME.txt". miscategorized, and other issues like the shout "Elemental Fury"
match "greatsword". Added these to the default config. should work so long as the potions list comes before the magic list. - Added greater and lesser powers to Shouts (now "Shouts/Powers") list. - Added "poison" to Potions list. "anywhere in the item's name" matching. Eg, "Mammoth Cheese Bowl"
now won't match the "bow" keyword in the Weapons list. CR\LF (for editing in, eg, notepad).